← North Carolina Warrior Dash – Qualified for the World Championships! This is an incredibly exciting post to write, and one that differs quite a bit from my usual running-related adventures. 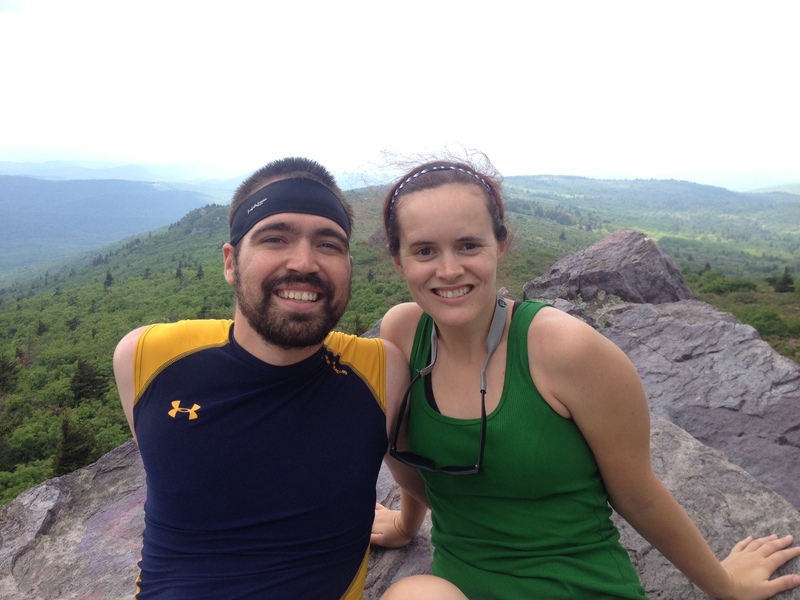 Over the past few months, Amanda and I have been talking about seeing all 50 states – the adventurer in me suggested on a whim to see if we could summit the peaks/high points of every state in the Nation. 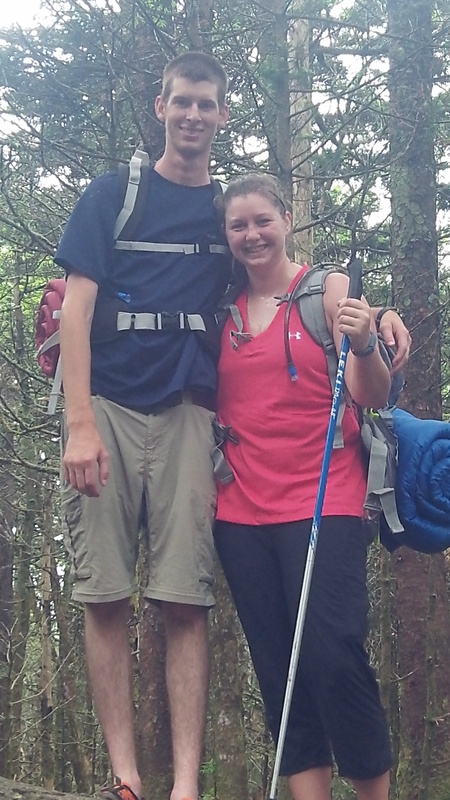 It’s exciting to announce that this past weekend Amanda and I officially started this extremely lofty goal by successfully summiting the 19th highest peak, Mount Rogers in Virginia. Our weekend-long trip began on Friday. We stopped by to grab supplies at Food Lion and then hit the road. The entire drive was only 2 hours, and I had made plans for us to stop in Marion, Virginia to eat lunch with a few of my old fraternity brothers, Jameson and Graham. Jameson is one of my very best friends and I hadn’t had the opportunity to see him since my wedding in December, and I hadn’t seen Graham in almost five years. We ate at a new Japanese restaurant, Yummy Yummy. The food was fantastic – the service was pretty lackluster. After two hours of reminiscing, we said our goodbyes and were off to our campsite for the night. We camped at the Grindstone Campground. We arrived, set up our tent, and waited for our friends Sarah and Phillip to arrive. 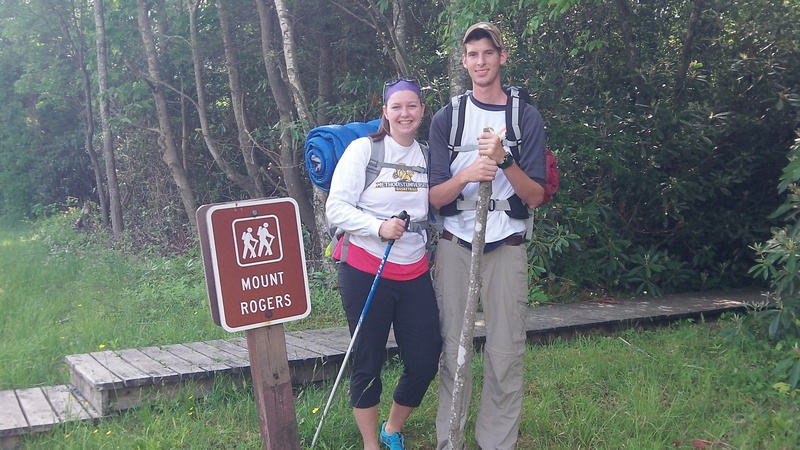 Sarah and Phillip are quite outdoorsy, so we were excited to share in this opportunity to experience our first peak with them. 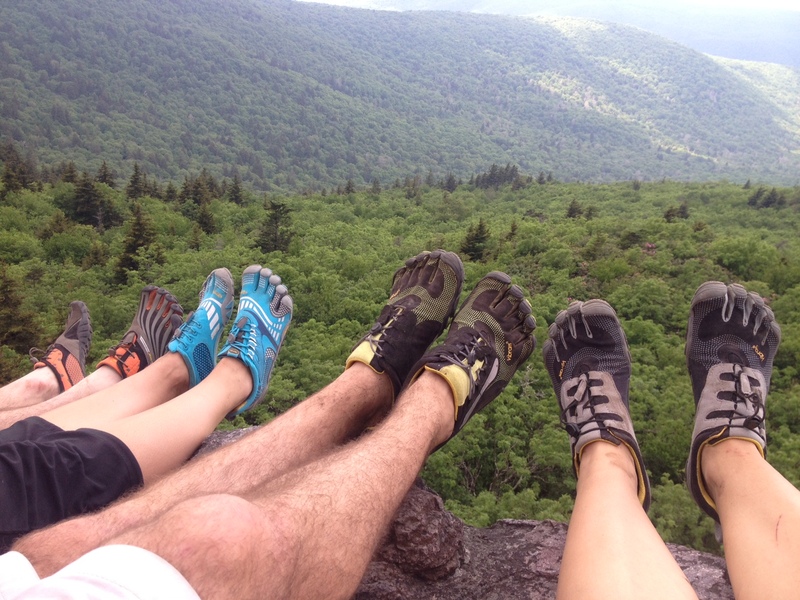 One of the coolest parts of the evening was that Sarah and Phillip both bought Vibram Five-Fingers to do the hike in! 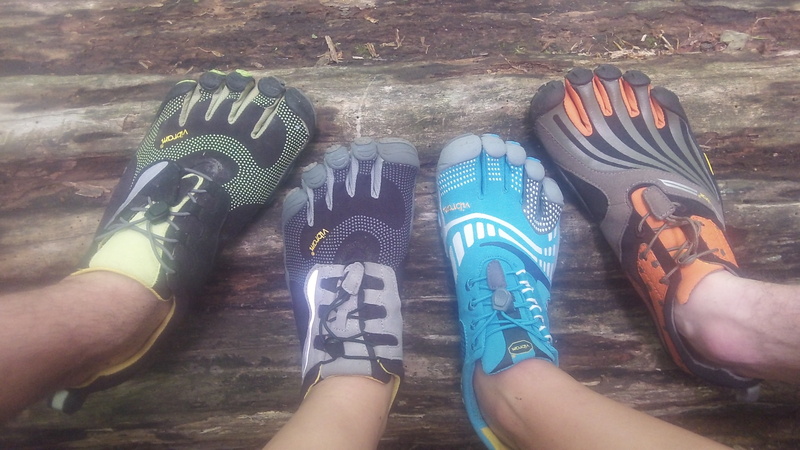 Amanda and I had stated over our private Facebook event that we would be doing them in Vibrams, and we knew that Sarah had purchased a pair, as well. What we didn’t know was that Phillip had also purchased a pair and that we would all be doing them in these awesome five-toed shoes. It actually became a theme for our weekend. 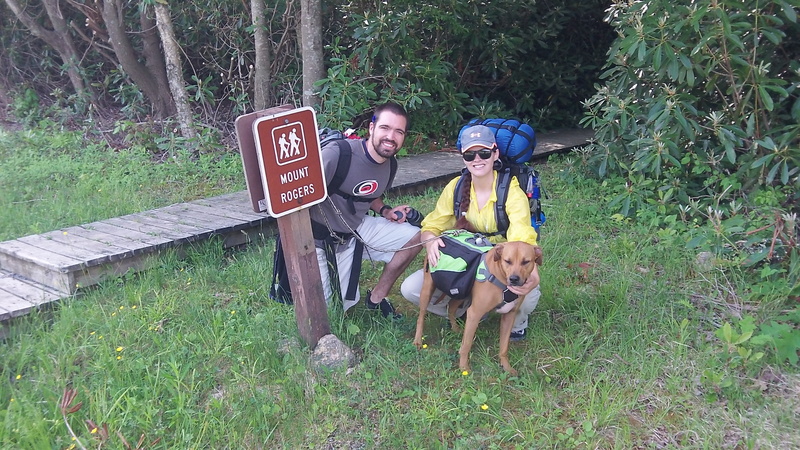 We ate dinner, made sure our bags were packed, and called it a night as we knew we had 3300 feet of elevation to gain and 21 miles over two days. Day 2 started out with breakfast and hitting the trail. It was a relatively uneventful first part of the day as we were mainly switchbacking and gaining elevation. 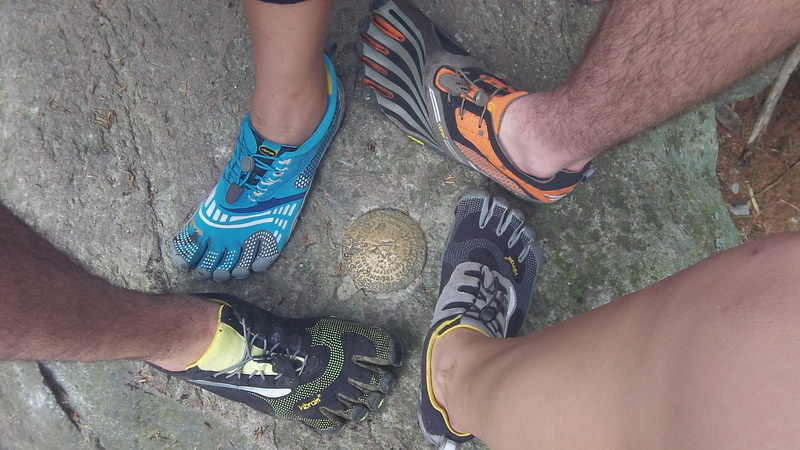 We stopped to take this photo of our Vibrams. 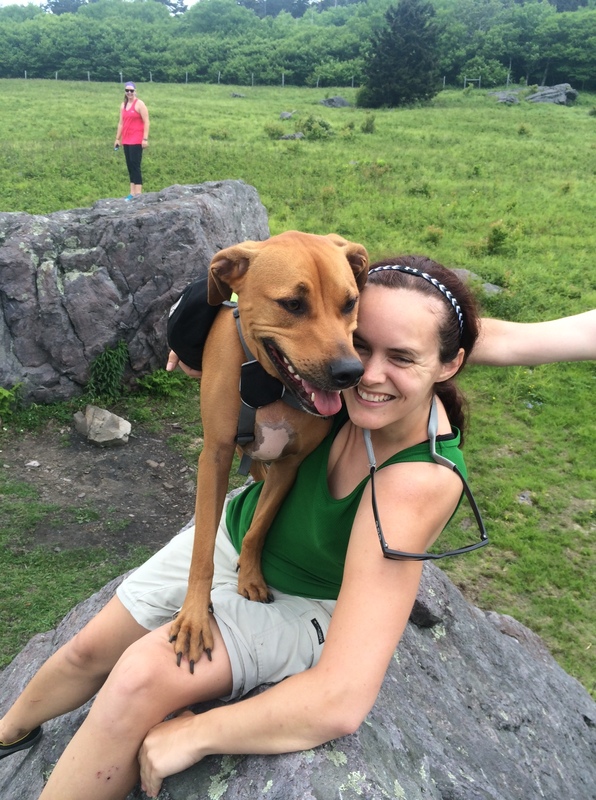 Shortly thereafter, our dog Anya had perhaps the first funny moment of the trip. We were walking and, as she did most of the trip, Anya was leading our group. All of a sudden we see Anya leap like a frog three or four times. We never heard her yelp in pain, but we imagine she was startled by a stick or bug rubbing up against her. Definitely funny. 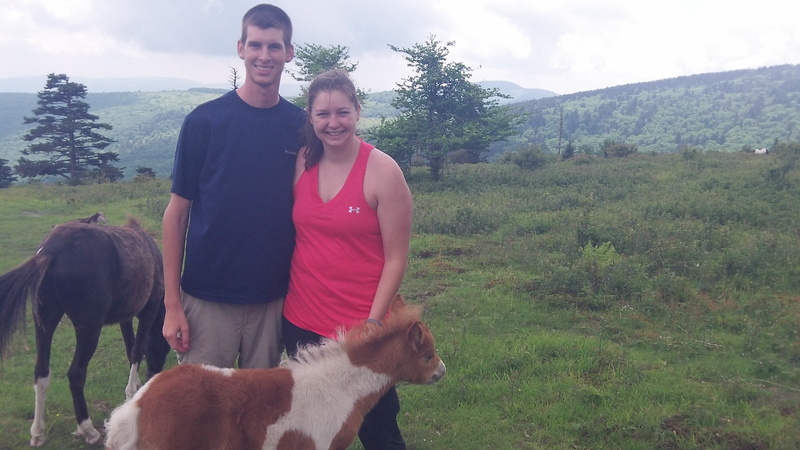 We continued on the Appalachian Trail and hit the first of many vistas overlooking the highlands. 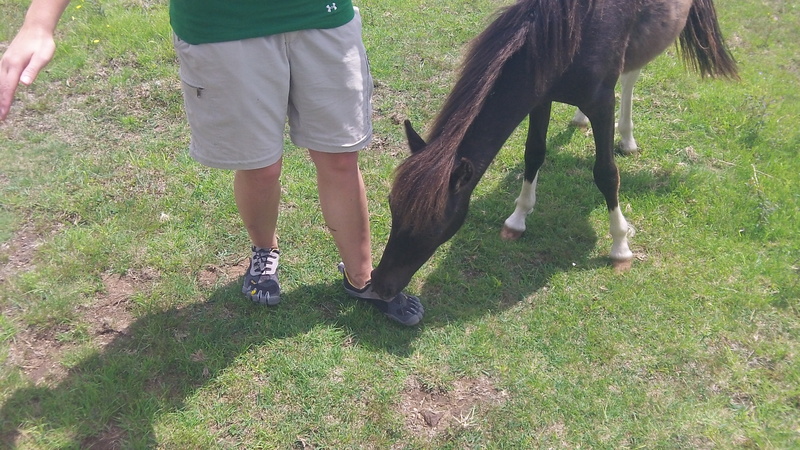 This was another definite highlight of our trip. Just take a look at these photos. Beautiful scenery and definitely an amazing experience. We also had another fun encounter with Anya. We were on this extremely large rock. We had left Anya down below and were taking pictures. 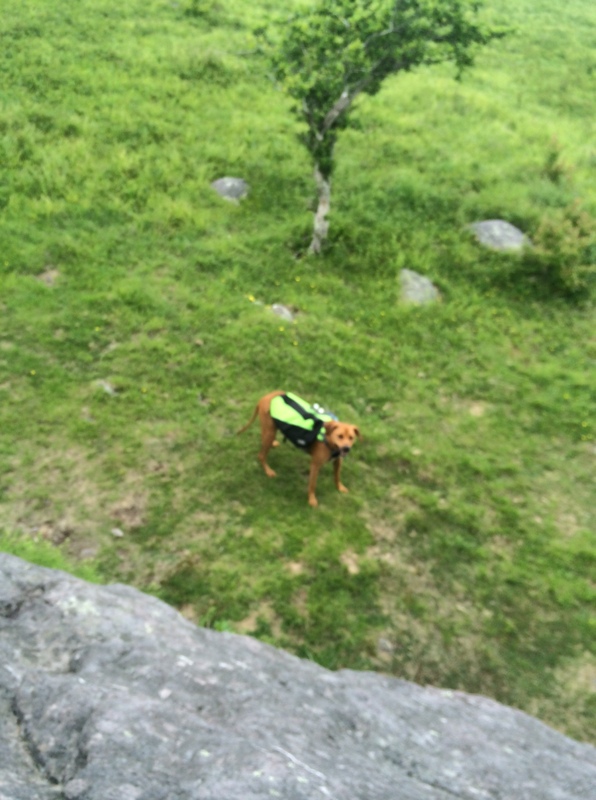 All of a sudden Anya comes jumping up the rock – a legitimate rock climber! We were so surprised. We had a bit of a time getting her down but everyone was off safely. We ended up continuing on, in and out of the forest. We eventually hit the Mount Rogers Spur Summit Trail (or something with a similar name), and climbed the .54 miles up to the top. We hit the top right at 1:30, which put us doing the 6.5ish miles in just under three hours, after doing some stopping, taking pictures, and not really pushing it too hard. Interestingly, there are two USGS markers. The first marker is the one you come to, and many people think that this is the summit. It actually isn’t. In order to get to the summit, you have to continue on another 10 or 15 yards. Here, you get to the actual summit of Virginia. We stayed here for a half hour, ate lunch, then continued on our way. 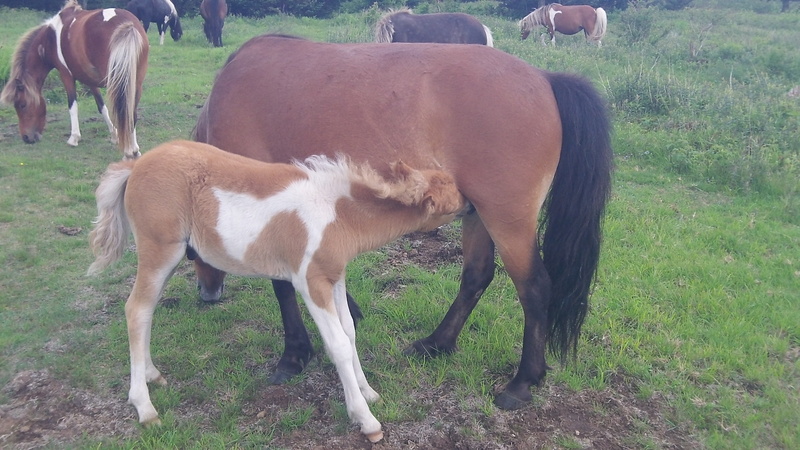 Perhaps the most memorable part of the trip for Amanda and Sarah occurred shortly after our successful summit – the Shetland ponies! 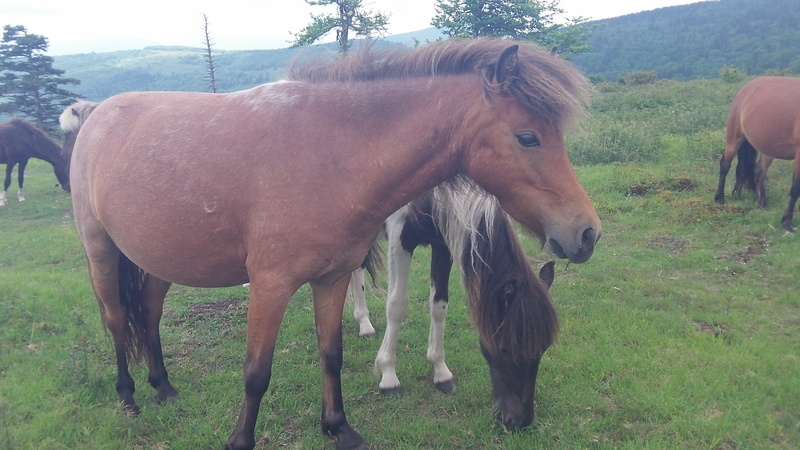 These ponies were magnificent. 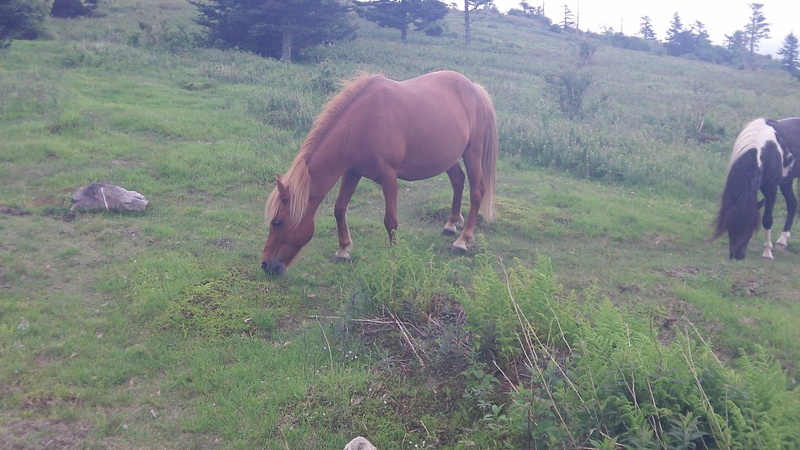 They literally came right up to you (more than likely expecting food!) and nuzzled into you. There were fantastic. We stayed here for quite a while – perhaps 45 minutes, watching these awesome animals. We continued on, knowing we had less than two miles until we were going to stop for the evening. 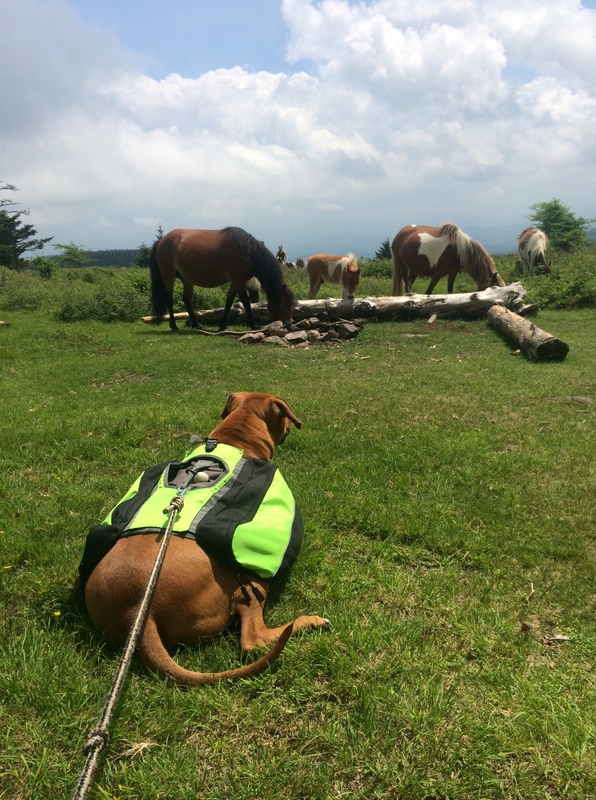 Anya even enjoyed watching the ponies! 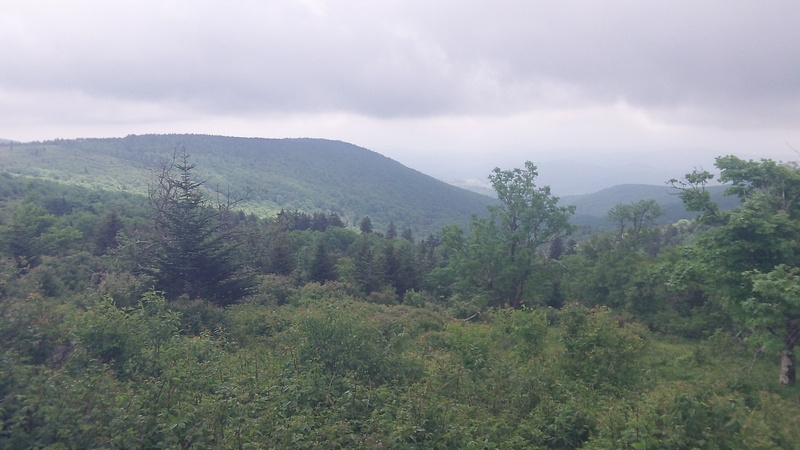 We had another awesome view out over the highlands right as we ended our walk on the Appalachian Trail and went on to a loose-rock Crest Trail. 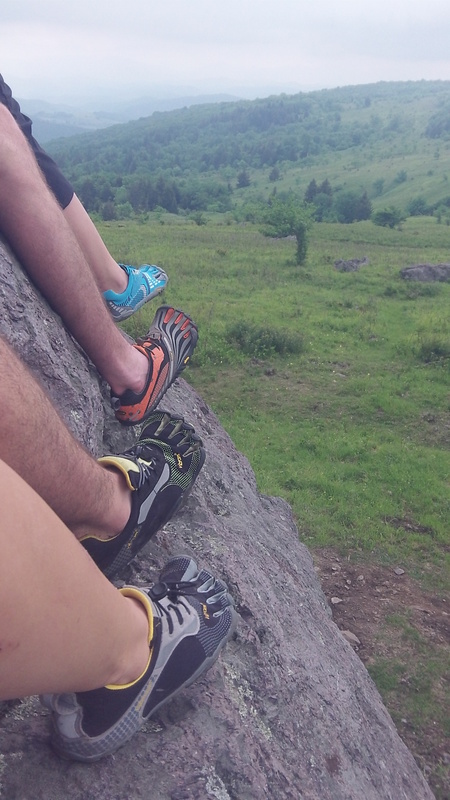 After these awesome views and awesome pictures of our Vibrams, we continued on. Perhaps the worst part of the entire trip occurred here. The loose-rock was absolutely terrible. 1.18 miles on this, and we were done, or so we thought. 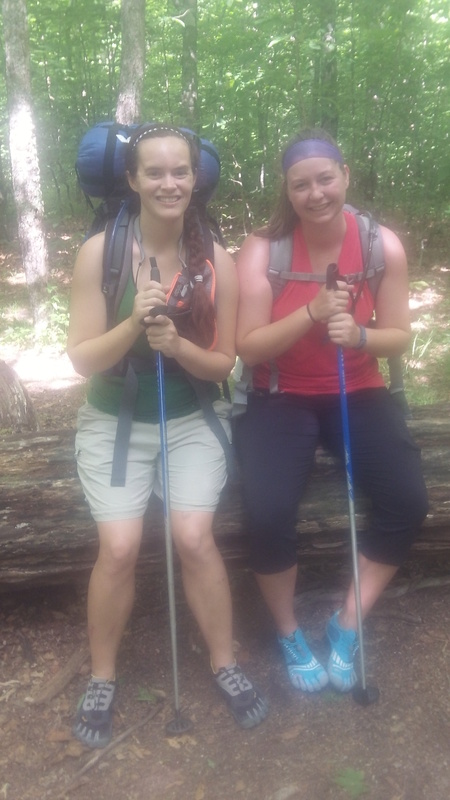 After the 1.18 miles, we were supposed to hit a campsite with a spring, grassy, and spacious. This wasn’t to be the case, however, as the campsite’s spring was dry. We were literally running to the campsite, only to be devastated when the campsite wasn’t going to work for the evening as we were running relatively low on water and wanted to be able to stock up using my filter. 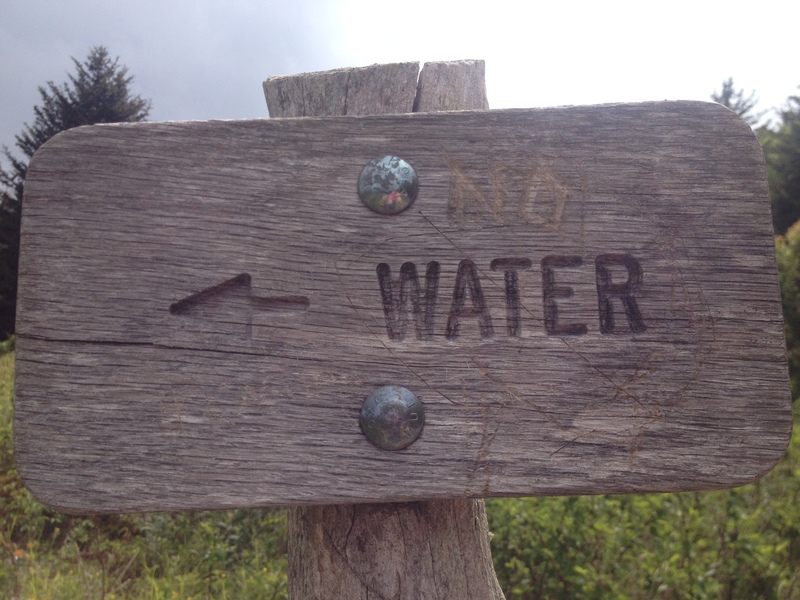 Someone had even carved out “No Water” on the “Water” sign. 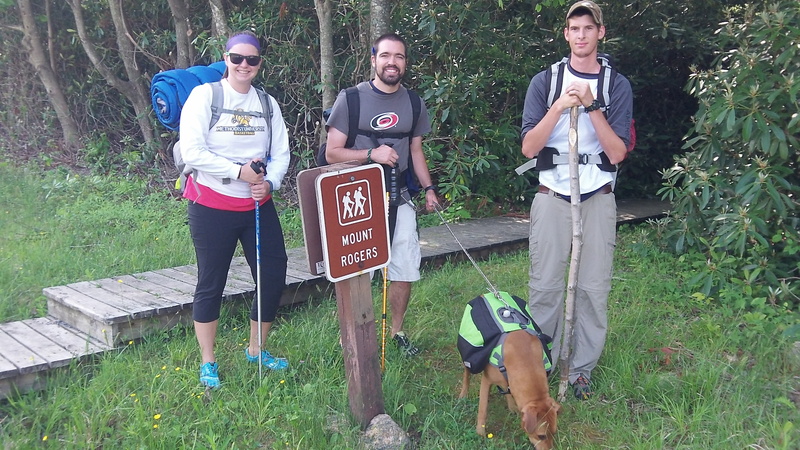 We regrouped and made the collective decision to make another 2 mile trek down to The Scales, a popular site along the Appalachian Trail. We made the two miles, were exhausted, and began setting up camp for the night. This was another really enjoyable part of our evening. Amanda and I set up our hammocks (more on those later) and Phillip and Sarah set up the tent. 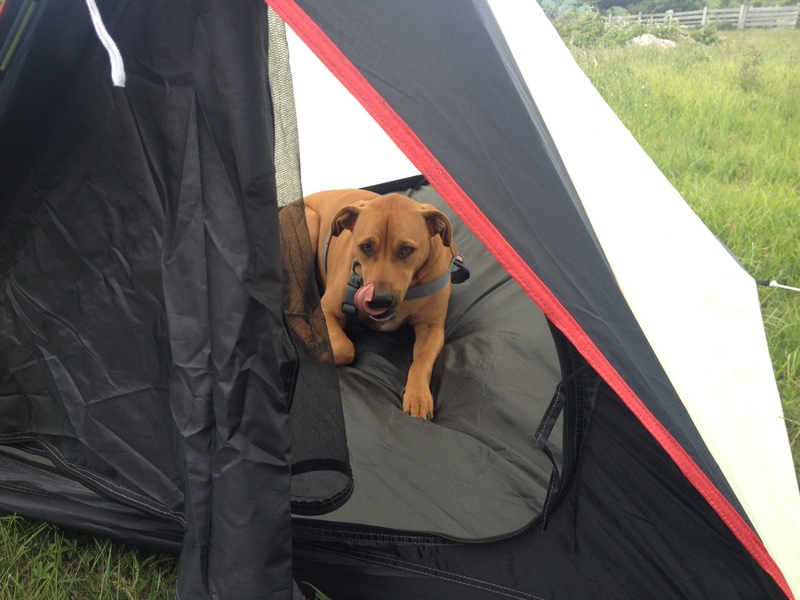 Anya, who was equally exhausted, immediately went into the tent and laid down – she was done for the evening! 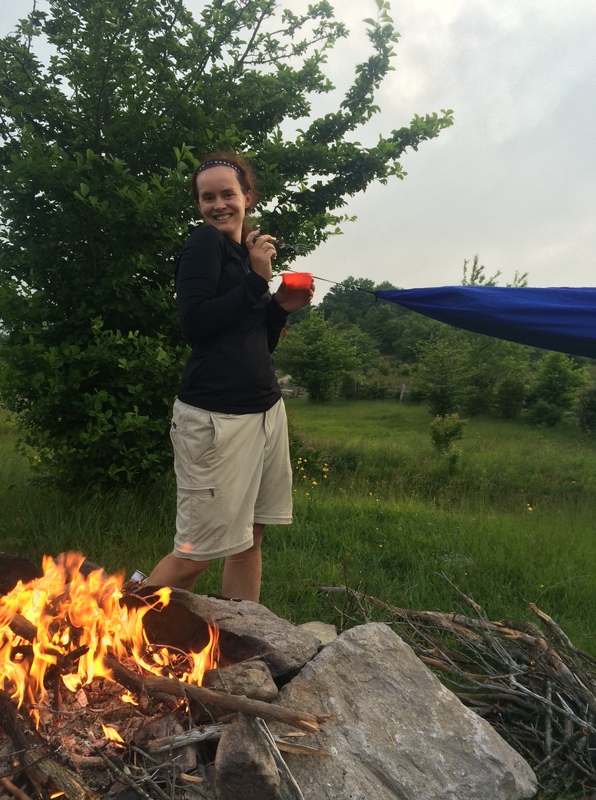 Amanda, who loves her fire, began working on fire and dinner. 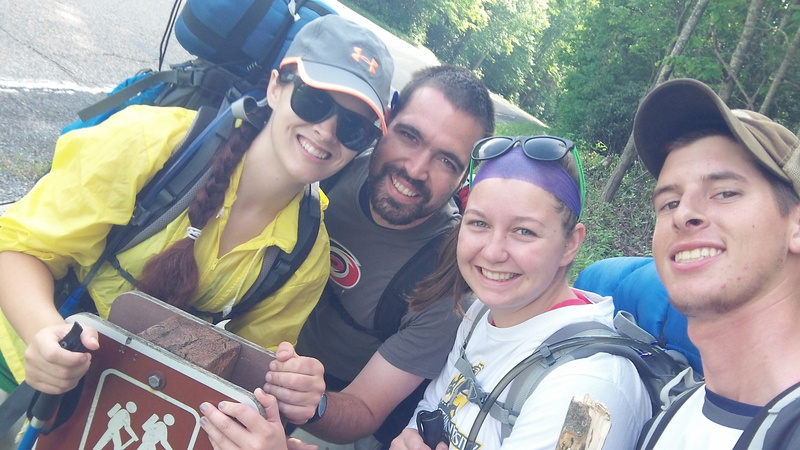 Phillip, Sarah, and I went looking for wood. All around us, people were struggling to find wood. Phillip set a trend, found massive piles, and soon everyone was copying him. 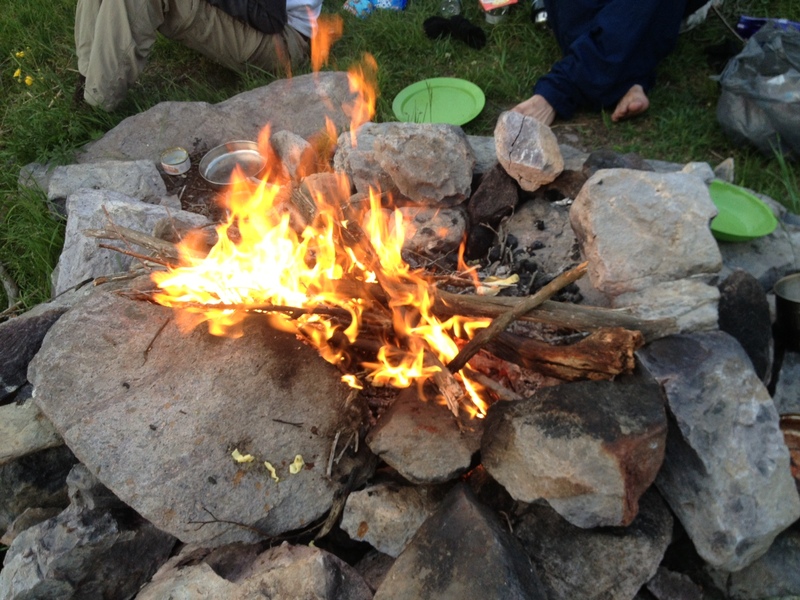 We had the best fire all evening thanks to Phillip. Dinner was fantastic, as Amanda and I bought supplies to do Chicken Quesadillas. 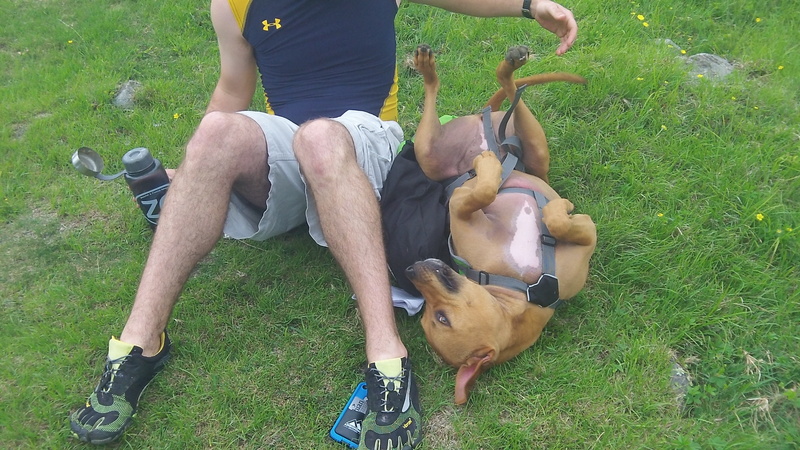 We also had some friend Vienna Sausages and some freeze-dried meals. All in all, we ate like kings. The evening was pretty uneventful. We all called it a night shortly before dark. Amanda and I were experiencing our hammocks for the first time. It was quite a crazy experience, as weather that high can quickly change. We definitely weren’t sure what our experience was going to be, and as we were packing up for the night, it definitely looked like it was going to rain. Thankfully, there was no rain, but the wind got up pretty high during the night. 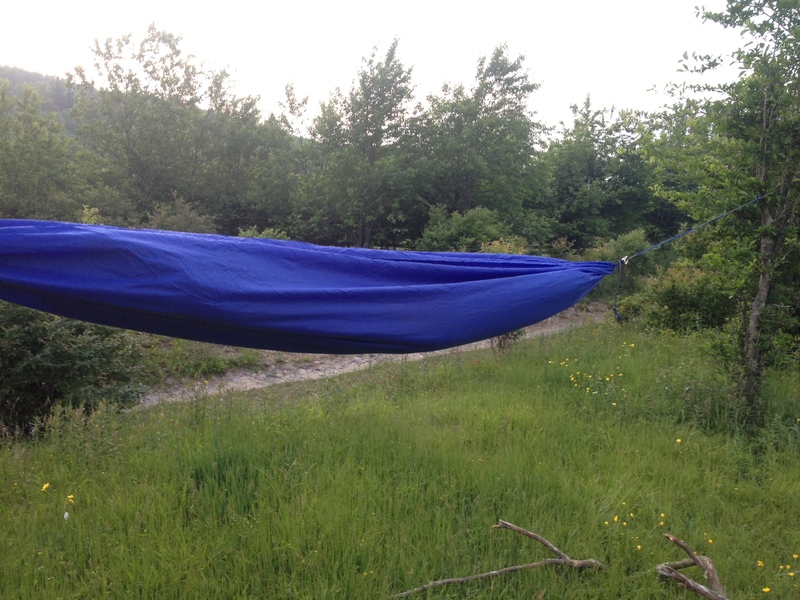 There were a couple of occasions where I was woken up by the wind moving my hammock. In fact, for a majority of the evening I was awake, I was watching my tree shake back and forth! Pretty cool experience. Day 3 of our trip was even more uneventful. 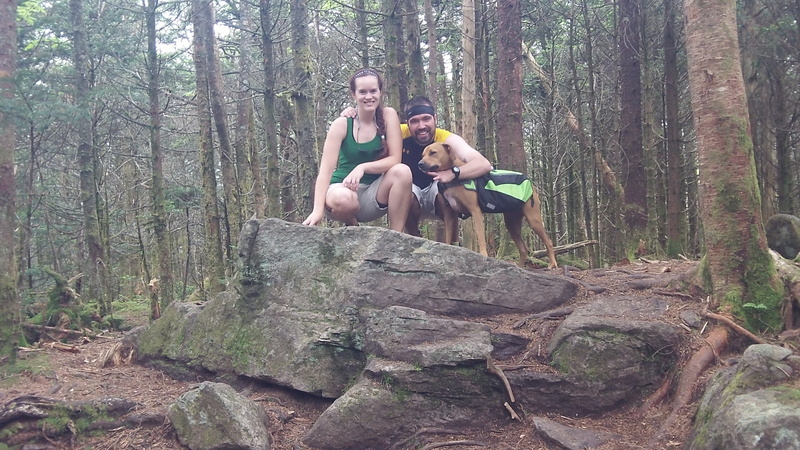 We got up, filtered water, and hit the trail. We had a little over 7 miles to go and most of it was downhill. We knocked it all out in less than four hours and hit the road. 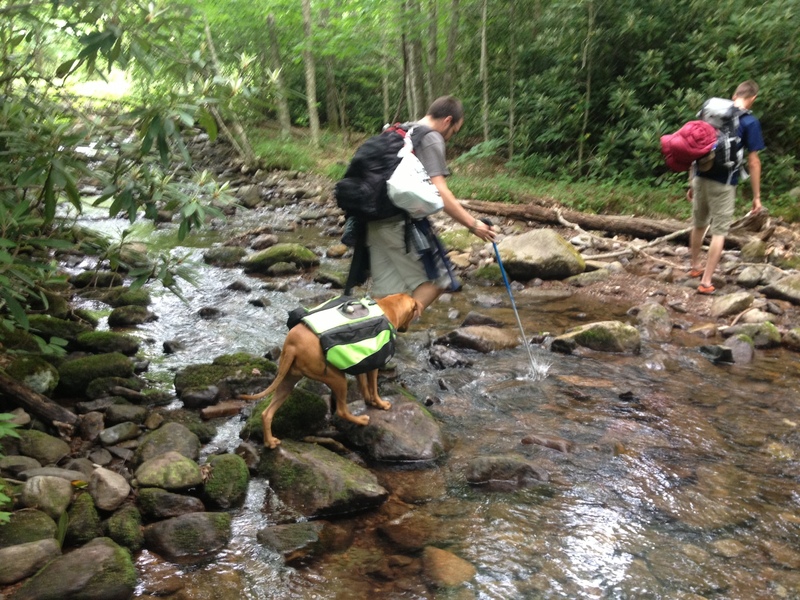 One of the coolest parts of the day was that Anya was able to cross her first stream! We had to show her where to step, but previously she had been so terrified of water it was a moment worth capturing! We ended up eating at Macado’s in Marion, Virginia. 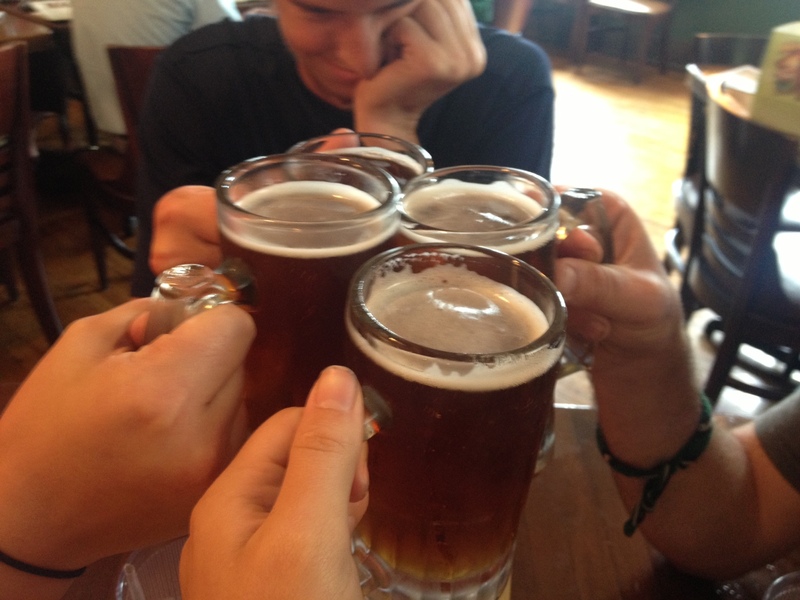 We had celebratory beers and definitely were excited for where this newfound adventure is going to take us! First of many peaks to bag! –	A successful first summit! –	Great times with great friends. 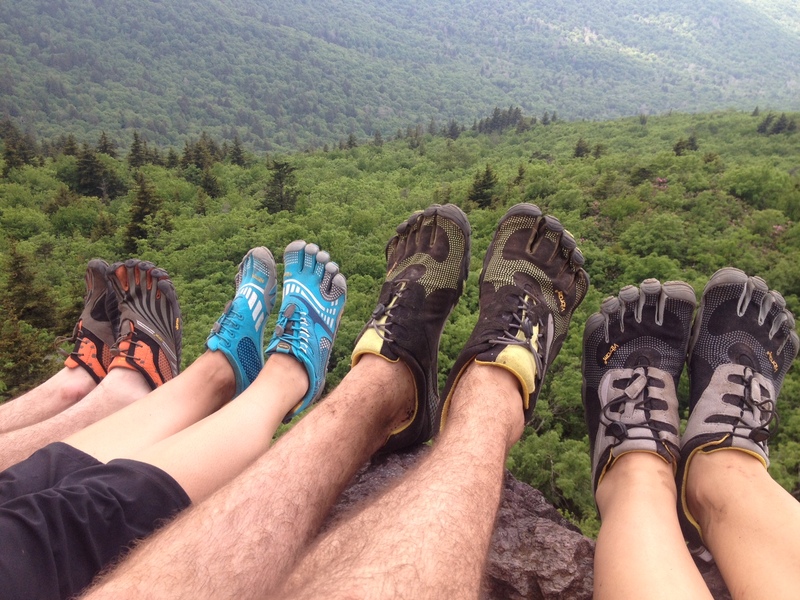 –	Us all doing the weekend in Vibrams. 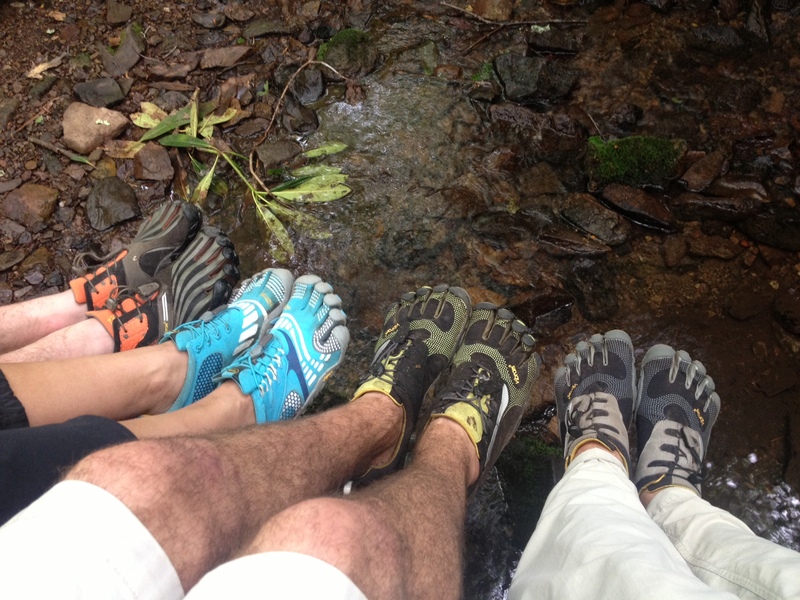 We had a number of people ask us along the way if we liked the shoes – it was an overwhelming YES! 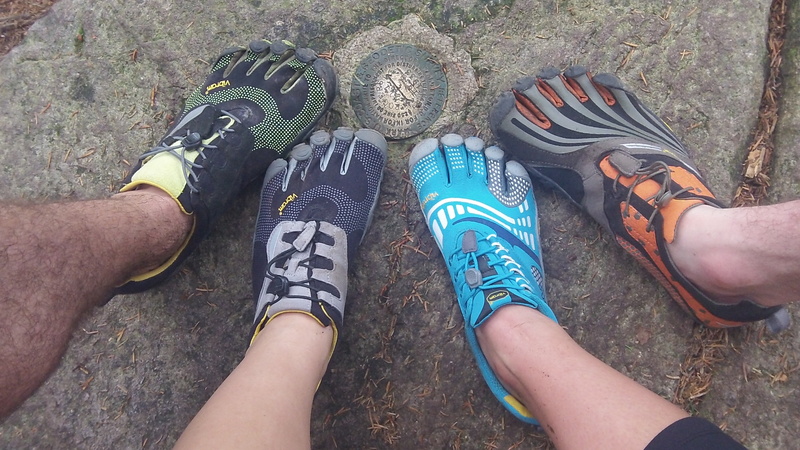 We absolutely loved doing this adventure in Vibrams, and seek to continue to use Vibrams as our Peakbagging shoes of choice! 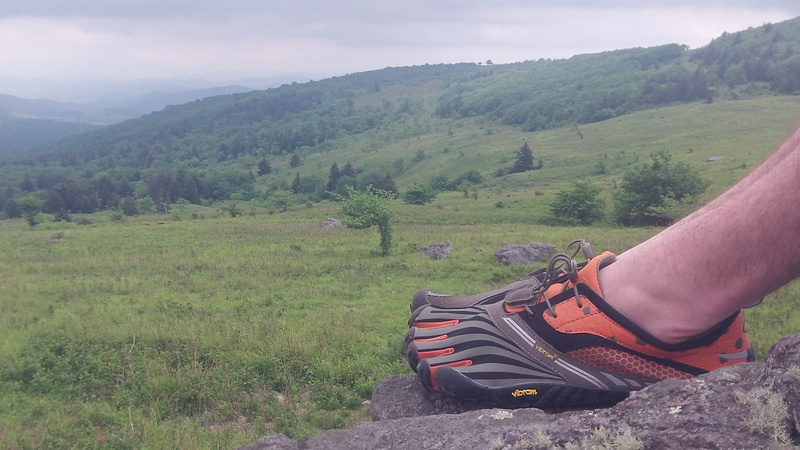 This entry was posted in Uncategorized and tagged Appalachian Trail, High Points, Hiking, Marion, Mount Rogers, Peakbagging, Summit, Vibram, Vibram FiveFingers, Virginia. Bookmark the permalink. Thank you for posting this! 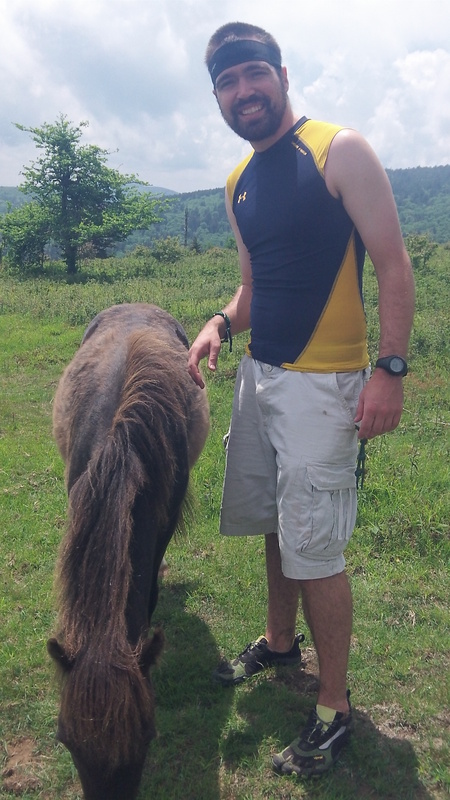 My friend and I were looking for a loop to do on 4th of July weekend for my first backpacking trip. Lots of great pics. Of course! 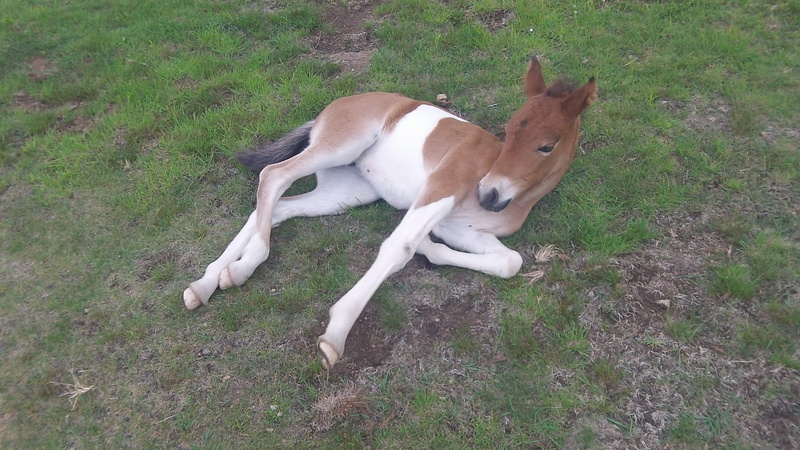 Thank you for posting a comment! Enjoy your trip! I would definitely recommend this one. 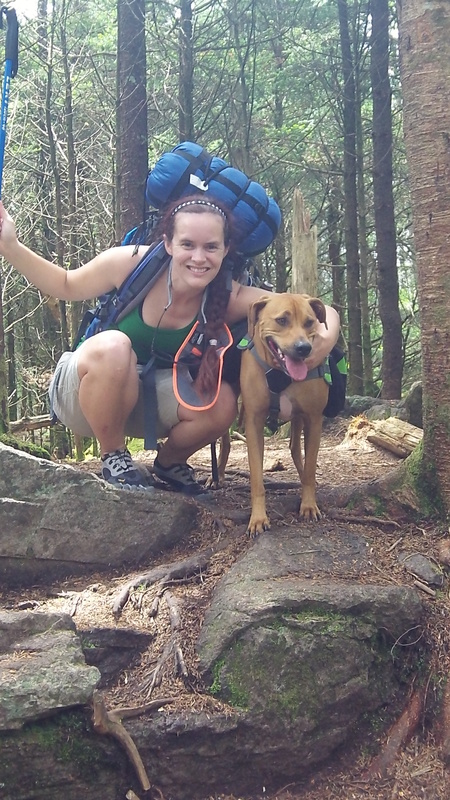 If you want the directions to which trails we hit and all the logistics, go to http://www.midatlantichikes.com . It has all the trail notes there! Thanks for posting this Ryan. This is really helpful as I’m planning a trip in August\September. I’m having some trouble finding your notes on over at http://www.midatlantichikes.com. Could you help me out? Thanks! Hey Rob! My apologies for just now seeing this! We’re deep in the middle of student-staff training here at CCU and that’s where all my free time has went! Enjoy! 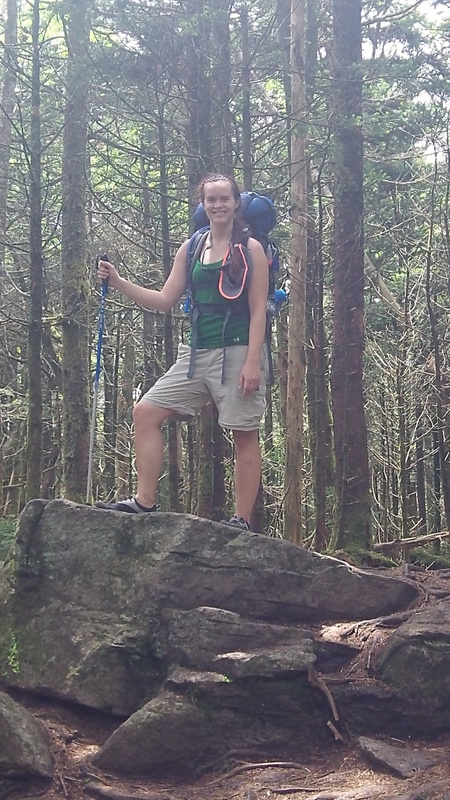 Let me know how your hike goes and if you have any other questions! I am planning this hike in April with my husband, reading your notes and seeing your photos is making me wish April would hurry up! Hello! I am so glad that you enjoyed the review and the photos. I hope it was helpful! It is, indeed, a wonderful hike. If you have any questions leading into the hike, please do not hesitate to contact me. I’ll be more than happy to talk about it with you! I will be hiking this with a small group in a few months, do you have any suggestions for breaking this up into less mileage per day – maybe 5 miles/day (less or more) stretched out over 4 days? We are wanting a more relaxed trip this time out to enjoy everything and not be rushed. Thanks!